The main engine shaft/prop vibration was gone; very smooth at all RPM following the removal of the tangled crab pot line. The Naiad stabilizers appeared to be ops normal; a river run isn’t a great stress test, but the fins were active and effective in the few boat wakes we encountered. The main engine oil pan leak also appeared to be under control; after 3 hours Rick noticed only a small seep on the right side of the pan gasket, so he put some more torque on those bolts. The engine-driven hydraulic pump for the Naiad stabilizers was still leaking grease through its aft seal even after torquing down the rear housing’s attaching bolts. 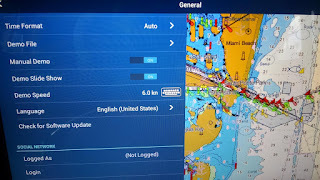 The Furuno chart plotter in the pilot house was showing the boat’s position as somewhere in the Atlantic off the coast of Miami….although we were in the Caloosahatchee River on the west coast of Florida. WTF. The damned stuffing box on the main engine shaft was showing signs of overheating again after just an hour underway…up to 133F. WTF times two. The continuance of the hydraulic pump grease leak wasn’t a real shock. 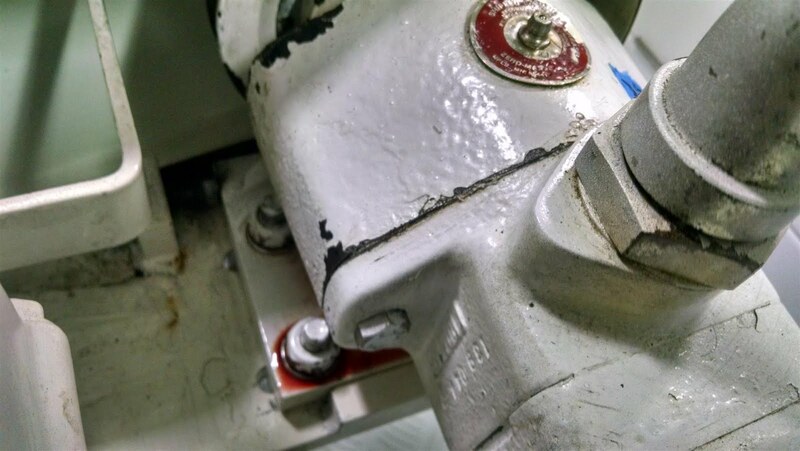 Since we had previously ordered a replacement gasket for the rear housing, once back at the dock Rick replaced that in short order without drama….although it will require a more extended sea trial to ultimately verify the fix. 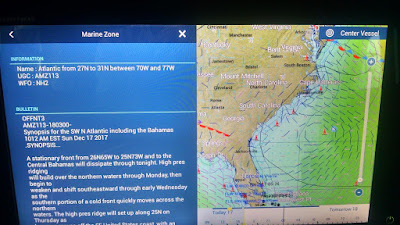 That the pilot house Furuno chart plotter seemed hopelessly lost – we were about 200 miles west of where it showed our position, and the heading was at least 90 degrees off as well – was initially a real head scratcher. As it turns out (and this took some sleuthing) somehow the Furuno’s MFD default settings had gotten all whacked out and its “Demo Mode” had been switched on; turning that off returned sanity and accuracy to the display. Accidentally Getting into "Demo Mode"
As for the damned stuffing box temps….grrrr. We had fought this battle for two months earlier in the year, and thought we had it solved after good behavior during the week long sortie from Palm Beach to Fort Myers. Guess not. Rick spent over an hour in the engine room on this last sea trial trying to get it back under control. Ultimately we got the temp down from 133F to 106F (at SST’s under 80F) by drastically loosening the box’s follower collar while underway (while Chelle ran the boat on the wing engine), but most assuredly something was still amiss. Once back at the dock Rick disassembled and repacked the stuffing box yet again, but this time using the Gore GFO packing material instead of the traditional PTFE (Teflon) rings. We had used GFO previously with success on our N47 to solve a similar issue, so we figured it was worth another try. This material isn’t without controversy – it’s expensive, and contains graphite, which is quite high on the galvanic nobility scale: don’t even think about using it on a bronze propeller shaft, unless you want to watch your shaft melt away as a sacrificial anode. But it’s as slippery as duck guts on a door knob, and the Aquamet stainless steel shaft on Ghost Rider theoretically should hold up to it. Stuffing box surgery is always a bit dicey while the boat is still in the water (recall our in-water shaft realignment?) because removing the follower collar and packing rings will get you get plenty of sea water into the bilge unless you work quickly. 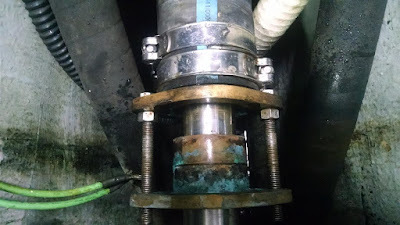 (If anyone ever invents a seacock for shaft water flow, we will buy it.) Unfortunately the Gore 3/8” packing size was too small – even with four rings inserted we could not adequately stem the water flow. Next we tried the Gore 7/16” size and found that too big to fit the groove. So we reverted back to the original packing yet again – it actually looked to be in good shape, water flow and alignment looked good as well. We are guessing that the crab pot tangle may have had an impact – either the vibration itself, or perhaps some debris ingestion into the shaft gland (hopefully now flushed out.) We’ll know more after the next sea trial. The dishwasher leak turned out to be relatively simple to locate – once the lower access panels were removed we could see water leaking (at an alarming rate) from one of the pan gaskets for the heating element; its attaching nut was a flimsy affair with a crack in it and consequently quite loose. Obtaining the replacement part took a couple weeks, but once it arrived the fix was straightforward, and Chelle is once again happy with the galley. 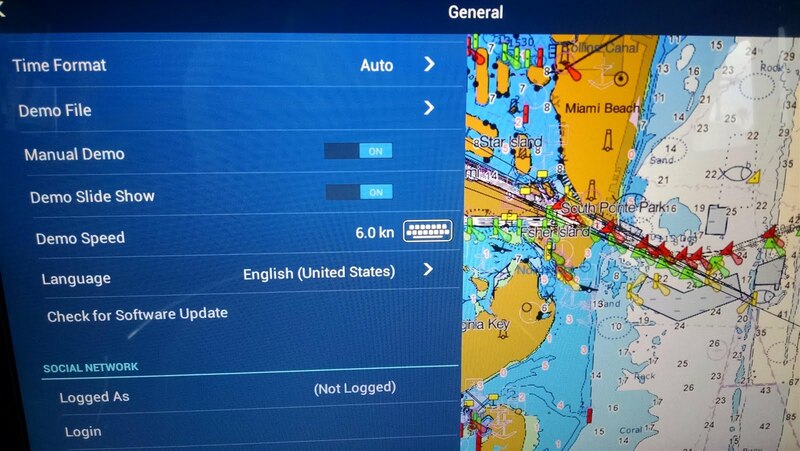 Being somewhat masochistic, we also decided to tackle a new project while all this was going on: installing SiriusXM weather functionality for the Furuno navigation system. 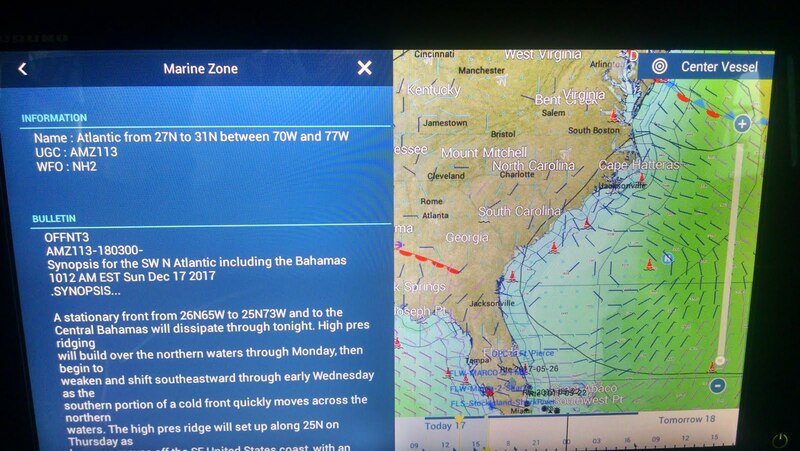 We’ve had that (or WxWorx which is very similar) on the last few boats and have found it extremely valuable to have near real time weather graphics overlaid on the chartplotter…especially during summertime cruising when we want to detect frontal and/or thunderstorm activity beyond the range of the boat’s radar. When combined with the GRIB file capabilities already onboard, the SiriusXM functionality would round out our meteorology tools nicely. 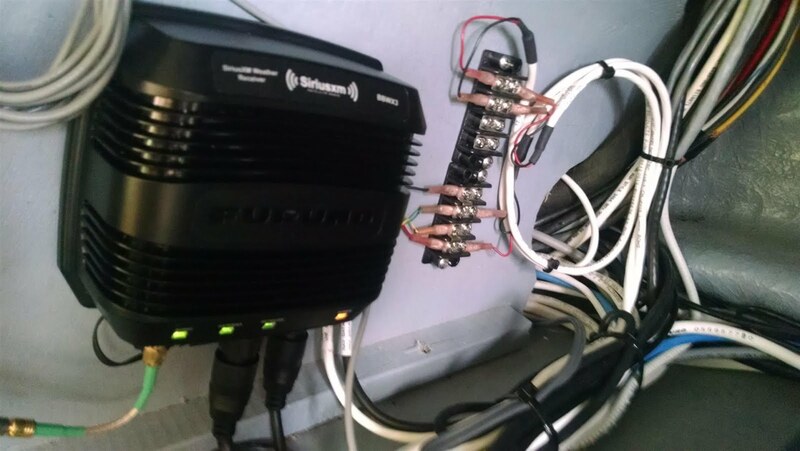 Furuno uses a black box called the “BBWX3” to interface the SiriusXM weather antenna to its network and MFDs, so we purchased one of those, and Rick spent a few deliberate hours getting it installed. That installation is fairly straightforward – just mount securely with a few screws, hook into a 12V power tap, run the Ethernet cable to the hub, and then attach the Shakespeare SRA-50 antenna cable; lastly power it up and activate the Sirius weather account. Simple, right? Not so much. After four days of post-installation troubleshooting we still were not receiving any weather data. Only after bypassing the Furuno hub and connecting the weather unit’s Ethernet cable directly to the MFD did we get weather data to display. A call with Furuno tech support revealed they were aware of a problem with their Ethernet hub, and they suggested we remove and send that unit to them (out on the west coast) for an update of some kind. 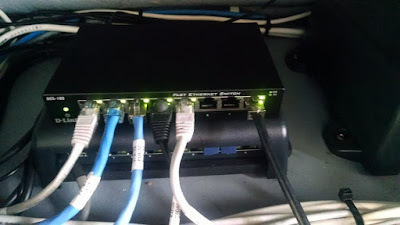 With five other Cat-5 cables plugged into that thing we weren’t too keen about crippling our nav network, so Rick substituted a standard 8 port desktop switch for about $25 – and that seems to work quite well so far. That Furuno hub is for now just a backup spare – although we can buy about 13 Cisco switches for what Furuno charges for one of their hubs. Finally...a Weather Display That Works. We sacrifice what is known as “power synchronization” (turning all other Furuno devices on or off with a single switch) but that’s a feature we weren’t using anyway. All that's left to do there is test network speeds to be sure we have not accidentally introduced any performance issues. Finally, Rick also managed to finally find and install a replacement battery temperature sensor (BTS) for our legacy Xantrex charger / inverter unit. That will enable us to re-test the LinkPro battery gauge setup with and without the automatic charge relays engaged, and get more definitive about the cause of the LinkPro undercharge readings. 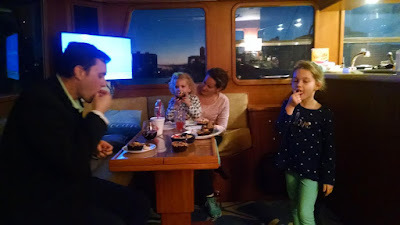 Despite all of that "boat business" we've still been enjoying the occasional time on the boat during our dirt-dwelling months at the condo. We recently had the pleasure of hosting good friend Scott Schatzle and his young family for a fun evening aboard Ghost Rider (Sangria for the adults, reindeer cupcakes for the kids!) Riley, at just 7 years, seems to be a budding engineer and kept Rick busy with some pretty penetrating questions about the boat's systems. Perhaps she should examine our stuffing box. And now it's time for some Christmas relaxation and fun. As has become our tradition, we are hosting Chelle's family for the holidays and finally enjoying some very pleasant weather in south Florida....plenty good enough for a 4 hour fishing charter the other day that netted us a tasty haul of Redfish and Spotted Seatrout for dinner. We hope y'all have a blessed Christmas, fun holidays and an excellent New Year.